I was given an opportunity to try these Manitoba Harvest Hemp Heart Bars through my association with Sweat Pink. I was eager to get them as I am a big fan of Hemp Hearts and use them regularly in a variety of ways. The bars come in 3 flavors... Vanilla, Chocolate, and Apple Cinnamon. I received Chocolate and Apple Cinnamon for this review. I was not disappointed! The flavors are subtle but tasty, and the texture of the bars is kind of creamy, yet still kind of chewy. Very nice. They have a good amount of healthy fats, proteins, and fibre, along with a bit of sugar. I used them as snacks on the go, and found them satisfying and convenient. If you are interested in trying them for yourself, Manitoba Harvest is offering an introductory discount code to get 15% off your order. Use code hhbarlaunch1015 at checkout until March 31, 2016. Manitoba Harvest is also sponsoring a photo contest. You can check out the details here. Just tag @manitobaharvest and use the hashtag #fuelledbyhemp to be automatically entered. Good luck! I have not tried yet. I don't buy too many bars but will check them out! Hemp is something I keep hearing about but haven't tried yet. Are they kind of like cereal bars? I tried them out as well and also loved the subtle nutty flavor and the clean ingredients. I need to give these a try. I have never tried hemp, but keep hearing all kinds of good stuff about it. Glad to hear that you liked them! I've heard the same feedback from others who also tried out these new bars. have never tried these - I tend to stick with my usual go to bars, if I do bars at all. I've seen a lot of people trying these out though. I haven't tried these yet, but I've read a lot of reviews. They sound yum! 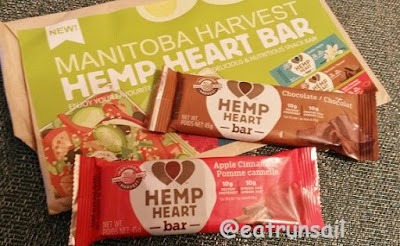 I love hemp hearts and loved the hemp heart bars - not too sweet but really filling. I haven't tried these but love Hemp Hearts and Manitoba Harvest. I will have to give them a try! I haven't tried the bars but am drinking their new Hemp Protein Smoothie and LOVE IT!!!!! These look like good snacks to stick in the children's lunch boxes.